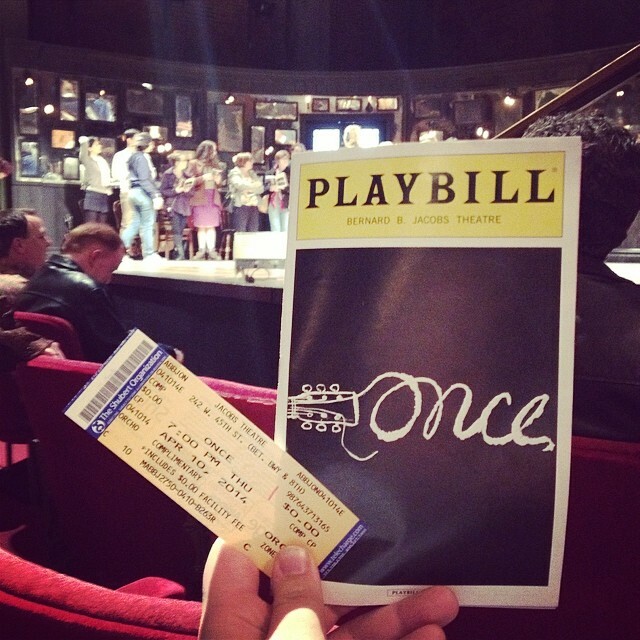 I was fortunate enough to see the Broadway tour of ‘Once’. This show was a little different than other Broadway shows I’ve seen in several ways. I love live music. Always have, always will. 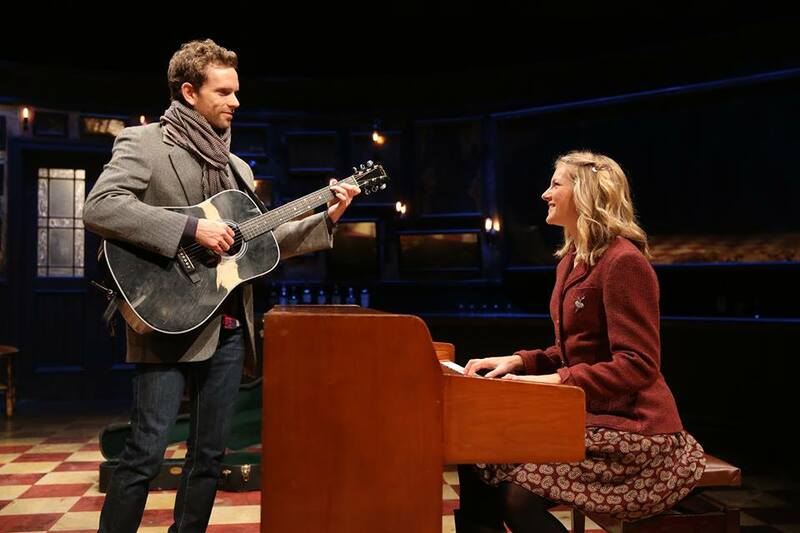 ‘Once’ gave the viewer an amazing performance by featuring actors who were also musicians. They not only sang the hauntingly beautiful songs this show is known for, but they played instruments at the same time. There was no gaggle of musicians in the orchestra pit, the actors were the orchestra, some playing as many as 4-5 instruments overall. One of the other big differences for this was the pre-show. If you’ve ever wanted to experience Irish craic, this is the way to go. The main set, which was very minimalist, included a bar with chairs lining stage left and right. Exiting cast members simply stepped to the side and sat down. Actors had taken up center court to play some fabulous pub songs while the audience was allowed to come up on stage to order a drink from the bar. There were lines down both sides of the main aisles that were just crazy long. The chick that ended up sitting next to me carried her wine in a sippy cup, not even joking. The bar was open on stage before show and during intermission. The atmosphere was perfectly set after this. Check out this video and see what I’m talking about! ‘Once’ is a musical adaptation based on the 2006 film written from a novel by Enda Walsh and was nominated for 11 Tonys at the 2012 Tony Awards, which went on to win 8 awards, including Best Musical, Best Actor and Best Book. ‘Once’ tells the story of a Dublin street musician who’s about to give up on his dream when a beautiful young woman takes a sudden interest in his beautiful love songs. As the chemistry between them grows, his music soars to powerful new heights, but their unlikely connection turns out to be deeper and more complex than your everyday romance. We see how love and music bind us all together. Stuart Woods and Dani de Waal play the leads of ‘Guy’ and ‘Girl’. He’s Irish, She’s Czech-Republican. One of the things I loved about Girl, was when she sat at the piano, she tells it ‘hello’, then makes Guy do it. One of the running jokes in the show was someone asking her if she was serious and she replies with ‘I’m always serious, I’ Czech!’The songs are very identifiable as being either Irish or Czech. The pre-show consisted of 6 songs that are not part of the soundtrack. Those first songs reminded me of the ‘Jolly Rogers ‘and especially of ‘Great Big Sea’ . By the way, one of the band members in ‘Great Big Sea’ is actor Alan Doyle, you might remember him from Russell Crowe’s ‘Robin Hood’ as one of his merry men, Alan-a-Dale. The songs that make up the heart of the performance are absolutely glorious, hopelessly glorious. I’ve had ‘Falling Slowly’ on a reel in my brain since the show and it’s a song I can’t shake and I’m not tired of it, either. See a video Ward and Waal performing ‘Falling Slowly’ and fall in love. The other big feature of this show was the theatre, itself. My home away from home for Broadway shows is The Fabulous Fox. Gilded detail is everywhere once you cross the threshold. Opulence is everywhere you look, from the thick carpet, to stained glass focal points along the ceiling and it’s sheer size makes this venue more than awe-inspiring, it’s almost another character, setting the mood for the performance ahead of you. 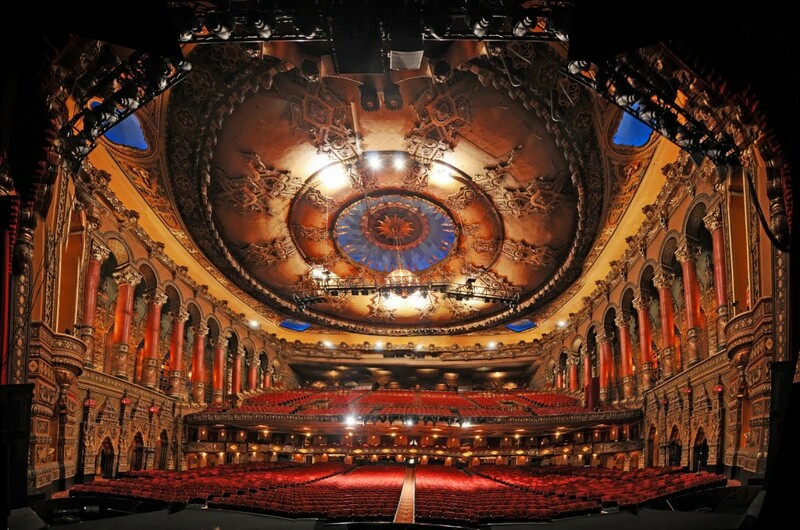 ‘Once’ is performing in St. Louis at The Fox until April 20th, then the production moves on to the next city. Luckily ‘Joseph and the Amazing Technicolor Dreamcoat’ is moving in on April 29th! Chazz Palminteri’s ‘A Bronx Tale’ is Headed To Broadway As A Musical!!! This entry was posted on Tuesday, April 15th, 2014 at 3:03 pm	and is filed under Events, Music, News. You can follow any responses to this entry through the RSS 2.0 feed. You can skip to the end and leave a response. Pinging is currently not allowed. « Texas FrightMare Is Upon Us!! Here’s What To Expect! !